David Unaipon’s Legendary Tales of the Australian Aborigines is part of the classical culture of Australia. The collection is as varied in subject as it is ambitious in scope, ranging from ethnographic essays on sport, hunting, fishing and witchcraft to the legends of ancestral beings who transformed the landscape in the Dreaming. The stories are unified by the voice of Unaipon, Australia’s first Indigenous author, whose familiar face now adorns the fifty dollar note. Unaipon led an exceptional life, spanning ninety-five years, working between cultures and across boundaries as an inventor, scientist, preacher, activist and author. Legendary Tales of the Australian Aborigines reveals as much about Unaipon, and the context in which he lived, as it does about the myths and legends of Aboriginal Australia. It is one of the great tragedies of Australian literature that the book was not published under Unaipon’s name until 2001, three-quarters of a century after it was written. David Unaipon was born of the Ngarrindjeri people in the Coorong region of South Australia on 28 September 1872, at Point McLeay Mission. At seven his parents, James and Nymbulda Ngunaitponi (later anglicised to Unaipon), sent him to mission school. At thirteen he was taken to Adelaide to work as a servant for C. B. Young, a prominent member of the Aborigines’ Friends’ Association. ‘I only wish the majority of white boys were as bright, intelligent, well-instructed and well-mannered, as the little fellow I am now taking charge of,’ Young wrote of Unaipon in 1887 (Jenkin, 1979: p. 185). In every way, he confounded contemporary stereotypes of Indigenous Australia. With the encouragement of Young, Unaipon had the freedom and resources to pursue his wide-ranging interests. He read widely, studied theology, mechanics and physics, educated himself in languages and oratory, and played Bach on the organ. In his 1954 pamphlet ‘My Life Story’, he described himself as a ‘product of missionary work’ and believed that he embodied the potential for ‘Aboriginal advancement’. He often declared in his lectures for the Anglican Church: ‘Look at me and you will see what the Bible can do’ (Jones, 1990: p. 303). But he was also proud of his culture, and remained connected to Ngarrindjeri traditions and philosophies. On 2 August 1924, Unaipon published an article in the Daily Telegraph titled ‘Aboriginals: Their Traditions and Customs’; soon afterwards he signed a contract with Angus & Robertson to make a book of the myths and legends of his people. The stories in Legendary Tales of the Australian Aborigines were collected over 1924–25 on a tour of southern and central Australia with an Indigenous translator. Most of the stories come from his own Ngarrindjeri people in South Australia, but he also recorded others from Victoria, Central Australia and Queensland. He recognised the diversity in Indigenous language and customs across Australia, but he also saw ‘a great common understanding running through us all’: ‘Our legends and traditions are all the same tales, or myths, told slightly differently, with local colouring, etc’ (p. 7). He infused the stories he collected with his own personal philosophy, and wrote them up in the formal, ornate literary style of the era, overlaid with biblical references and classical tropes. Unaipon’s publisher, George Robertson, seemed quite prepared to acknowledge the Indigenous authorship of the collection, paying him the standard writing rate of £2/2/ per 1,000 words and describing the work as ‘his book’. Yet in August 1925 communications between Unaipon and Angus & Robertson broke down. Unaipon continued to collect stories, but his telegrams seeking payment went unanswered. For several weeks his publisher went quiet while they weighed up how many stories to purchase. On 3 October 1925 Angus & Robertson offered to accept the remaining stories and move forward with publication, but, for some inexplicable reason, Unaipon never received this crucial letter. What happened next, as Stephen Muecke and Adam Shoemaker (2001: p. xxvi) explore in their Introduction to Legendary Tales of the Australian Aborigines, ‘had all the elements of the great dramas of literary history where reputations, envy, pride (and prejudice) are in play’. After more than a year of silence, the amateur anthropologist and principal medical officer of South Australia, William Ramsay Smith, stepped in and purchased Unaipon’s complete manuscript from Angus & Robertson to ‘edit’ and ‘prepare’ it for publication. In 1930, Smith published the collection under his own name and with a new title: Myths & Legends of the Australian Aboriginals. He made no acknowledgment of David Unaipon’s role in collecting and writing the stories, although there is one oblique reference to an unnamed ‘narrator’. Smith also included twenty-one other legends in the new publication, which some scholars, such as Mary-Anne Gale (2006), suggest were also written by Unaipon. This way of fishing requires a great deal of knowledge, or to be more correct, mathematical knowledge. I am not attempting to claim that my race are mathematicians from the civilised standpoint. But let us review them standing in their canoes … the speed at which it is travelling and the depth at which it is swimming has to be allowed for, and also the speed and depth of the fish at a distance of fifteen yards away, and the spear is thrown unerringly and strikes the fish (pp. 23-24). In Smith’s 1930 edition of the story, this lengthy passage on Indigenous ‘mathematical knowledge’ was edited down to a single, banal sentence: ‘This manner of fishing requires a great deal of knowledge, founded on observation and practice’ (Smith, 1930: p. 236). In another example, Unaipon described the complex ‘art of tracking’ in Indigenous society: ‘There is a whole science in footprints. Footprints are the same evidence to a bush native as finger-prints are in a court of law’ (p. 7). Smith simply removed this last sentence from his publication: one of many instances in which he refused to accommodate Unaipon’s parallels between cultures. It was not until 2001, with the support of Unaipon’s descendants, that Muecke and Shoemaker retrieved the original manuscript from the State Library of New South Wales and finally published it under Unaipon’s name. Although Unaipon did not achieve fame as an author within his lifetime, he was widely celebrated as a scientist and inventor. He took out provisional patents for nineteen separate inventions, including a centrifugal motor, a multi-radial wheel and a mechanical propulsion device. He was particularly attuned to the benefits of Indigenous knowledge, and in 1914 he designed something akin to a modern helicopter by studying the aerodynamic properties of the boomerang. But his most successful invention was his modified design for a sheep-shearing comb, which converted curvilineal motion into straight-line movement. It was introduced in 1909 and remains the basis for modern handheld shears, although, as with much of his writing, Unaipon never received any financial credit. Indeed, Muecke and Shoemaker (2001) suggest that the very act of collecting and writing the legends allowed Unaipon to escape the constraints of missionary and state authorities and gain a taste of the freedom of that ‘wonderful life’. In an era of legislated racial hierarchies, Unaipon used Legendary Tales of the Australian Aborigines to appeal to a common humanity. He hoped his readers would see that ‘Human nature is the same in the Australian Aboriginal as it is in the white, brown or yellow man, irrespective of nationality, language and religion’ (p. 134). He drew upon his theological knowledge to reconcile the different cultures he moved between and he framed local legends in ways that would be familiar to his European audience. The ancestral being, Narroondarie, emerges in the stories as an Aboriginal ‘Budha, Mahomet and Christ’ who ‘was sent by God with a message and teaching’ (p. 134); the evil serpent of the Bible is personified as the Mischievous Crow; and ‘Nhyanhund or Byamee, Our Father of All’ filled the role of a God or ‘Great Spirit’ who ‘is in all things and speaks through every form of Nature’ (pp. 120, 151). These literary devices served to validate the Aboriginal legends in the eyes of his European readers and to build bridges between the cultures. ‘The Australian Aborigines,’ he asserted, ‘have a greater and deeper sense of morality and religion than is generally known’ (p. 150). Even with the strong religious and classical overtones in Unaipon’s writing, it is the Indigenous creation stories that remain the heart of the book. Unaipon tells the legends of the faraway islands where all animals, birds, reptiles and insects lived ‘at the beginning of day’; how the great philosopher, explorer and astronomer, the Koala, discovered Australia and led a large fleet of canoes to the new country; and why, on arrival in Shoalhaven, the Koala lost his adventurous spirit, and with it, his tail. He evokes the image of ‘strange beings’, such as the mythical Bunyip, ‘who lived a long while ago, many, many years, before Captain Cook found a landing at Kurnell’ (p. 217), and he recounts the travels of ancestral beings, such as Narroondarie’s wives, who were transformed into stones off the coast near Kangaroo Island. Although Unaipon wrote that ‘[s]ince coming to Australia thousands of years ago, there has been probably little or no change in the habits and the customs of my people’ (p. 5), the legends – and the narrator – tell of a much more dynamic culture. The ancestral spiritual leader, Nebalee, for example, lives at the nineteenth-century mission at Point McLeay, while Narroondarie’s legendary wives sleep ‘near the estate of the late T. R. Bowman’ (p. 125). These supernatural forces are not relegated to a distant past: they continue to interact with the modern world. European society has been absorbed into the existing cultural landscape. Like Unaipon himself, the legends move between cultures and across boundaries. ‘Perhaps some day,’ Unaipon reflected, ‘Australian writers will use Aboriginal myths and weave literature from them, the same as other writers have done with the Roman, Greek, Norse, and Arthurian legends’ (p. 4). In a sense, this is what Unaipon has achieved with Legendary Tales of the Australian Aborigines. By embedding the stories in the language and frameworks of classical and religious texts, Unaipon was making the case for the tribal laws and customs of his people to be recognised as part of the same literary canon. His book is a masterful celebration of Indigenous life and culture, and it gives us a fascinating insight into the mind of a great Australian. Gale, Mary-Anne, ‘Giving Credit Where Credit is Due: The Writings of David Unaipon’, in Gus Worby and Lester-Irabinna Rigney, eds., Sharing Spaces: Indigenous and Non-Indigenous Responses to Story, Country and Rights (Perth: API Network, 2006), 49-68. Jenkin, Graham, Conquest of the Ngarrindjeri: The Story of the Lower Murray lakes Tribes (Adelaide: Rigby, 1979). Jones, Philip, ‘Unaipon, David (1872–1967)’, Australian Dictionary of Biography 12 (Melbourne: Melbourne University Publishing, 1990), 303-305. Muecke, Stephen (and Adam Shoemaker), ‘Introduction: Repatriating the Story’, in David Unaipon, Legendary Tales of the Australian Aborigines, edited by Stephen Muecke and Adam Shoemaker (Melbourne: Melbourne University Press, 2001), xi-xlvi. Smith, William Ramsay, Myths & Legends of the Australian Aboriginals (London: George G. Harrap, 1930). Unaipon, David, ‘Aboriginals: Their Traditions and Customs’, Daily Telegraph, 2 August 1924. Unaipon, David, My Life Story (Adelaide: Aborigines Friends Association, 1954). 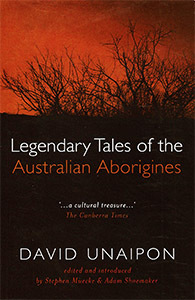 Unaipon, David, Legendary Tales of the Australian Aborigines, edited by Stephen Muecke and Adam Shoemaker (Melbourne: Melbourne University Press, 2001). Stephen Muecke is Professor of Cultural Studies in the Faculty of Humanities and Social Sciences, University of Technology, Sydney. His previous publications include Paperbark: A Collection of Black Australian Writings (1990) and No Road: Bitumen All the Way (1997). Adam Shoemaker is Professor and Dean of Arts at the Australian National University in Canberra. He has written and edited six books on Australian Indigenous literature, includingBlack Words, White Page (1989), Mudrooroo: A Critical Study (1993), and Oodgeroo: A Tribute (1994). BILLY GRIFFITHS is a Melbourne-based writer and historian. He is the author of The China Breakthrough: Whitlam in the Middle Kingdom, 1971 (2012) and co-editor (with Mike Smith) of The Australian Archaeologist’s Book of Quotations (2015).